A significant portion of people suffer from recurrent bouts of neck pain, it could be said that looking backwards into the past strains the neck , and is generally an unhealthy experience! The neck is a particularly complex and vulnerable part of the human body. Modern day sedentary learning and work environments place a lot of strain on the structures of the neck and upper back. Hours in the same posture lead to muscle fatige, spasm and weakness with increased pressure on the discs and joints in the neck. From a young age it is very important for kids to develop and upper back and neck strength while learning in an environment that supports them min optimal posture. Whiplash is an injury that requires very specific consideration and management. It is a unique mechanism of injury that results in compression and distraction injuries to each side of the neck, often causing widespread trauma. Onset of symptoms can take 2-3 days or can take months to years to manifest. The management process has to be gentle and progress with the healing process, pain management in important. Specific exercises to regain position and movement sense (proprioception) of the head and neck may need to be done as well as progressive strengthening to minimise chance of developing a chronic whiplash disorder (WAD). Strong treatment and manipulation should be avoided until the acute injuries have healed. Muscle strain and spasm - The most common cause of a painful and usually stiff neck is due to muscle spasm in the neck and upper back area. Joint sprain - Damage to the neck joints may be due to degeneration (wear and tear), sudden uncontrolled movements, repetitive strain movements or trauma (eg whiplash). Associated symptoms would be a lack of range, deep pain, possible pain down arm and/or visible changes on X-ray. 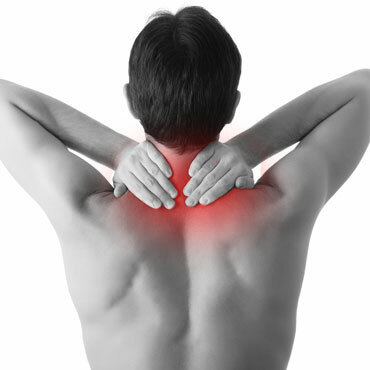 There too is an often a significant amount of muscle spasm in the surrounding area, causing tenderness to the touch. Disc injury - Onset of a disc injury can be sudden, like with a sneeze or sleeping badly on a couch, or gradual. It is often described as an extremely unpleasant, intense persisting pain in the upper back-shoulder blade area and is associated with limited range of neck movement and possibly an ache or pins and needles in the arm.